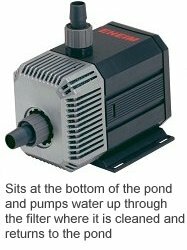 What does a Pond Pump Do? A pond pump is connected to the electrical supply and submerged at the bottom of the pond. It provides all the power to circulate the water through waterfalls, fountains, ornaments, filter systems, and sterilizer units. The proper pump and circulation system is very important for the ecosystem of your pond. Pumps that power water features and filters keep the water moving, providing the necessary oxygen levels for healthy fish and plants and discouraging mosquito populations. A good rule of thumb for evaluating how large pond pumps should be to provide filtering only is to choose a pump that will turn half the volume of the pond per hour. Therefore, if you have a pond whose volume is 1000 gallons, a pump that will pump 500 gallons per hour is adequate. Generally, the more features added to the system, the more powerful the pond pumps must be. 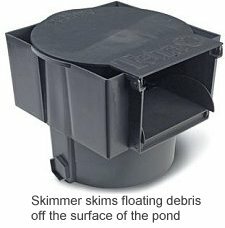 If you want to use a pond skimmer, the best way to evaluate the size of the pond pumps are to multiply the surface area of the pond by 10 to 15 times and use a pond pump with that many gallons per hour pumping capacity). Waterfalls present their own challenges. You must keep in mind how wide the water fall is and how high. Be sure to check the "head" or pumping height rating on any pond pump you are considering. A waterfall with a 10 foot head will need a pond pump capable of delivering that type of pressure. Pond Pumps deliver much less than their maximum rating at higher pumping heads, and longer pipe lengths or 90 degree elbows will increase the head measurement. 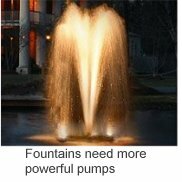 After you have decided how much volume you need to turn for filtering how much surface area you need to skim if you are going to use a skimmer, and how much head height you need for the waterfall(s), read the specifications on each pond pump. Choose the pond pump which delivers at least the minimum requirements for the most heavy activity. In some cases, it may be advisable to use multiple pond pumps for multiple or larger streams, fountains, or heavy fish loads. However, most pond owners choose one slightly more powerful pond pump, as it is less expensive to invest in a single pond pump and, contrary to popular opinion, higher pumping capacity will not diminish the biological activity of the filter.